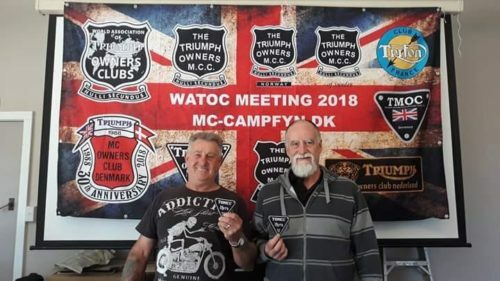 Wanganui | Triumph Owners Motor Cycle Club NZ Inc.
Abbo (Alan Abbot) and Westy (Allan Westwood) receive their 15-year badges at the 2019 AGM. It looks like Westy has just remembered how old that makes him. Abbo has forgotten! 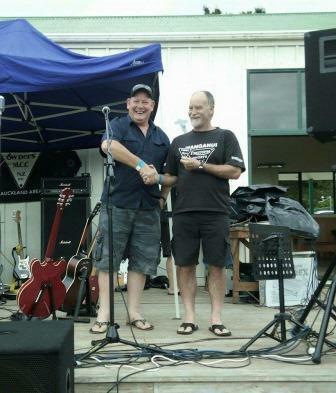 Bob Anderson is presented with his 15-year badge by TOMCC Wanganui co-ordinator Tim Fraser. Bob mistakenly thinks (like the Ravenous Bugblatter Beast of Traal*) that if he can’t see you, then you can’t see him. Lance Nixon is presented with his 10-year badge by TOMCC Wanganui co-ordinator Tim. 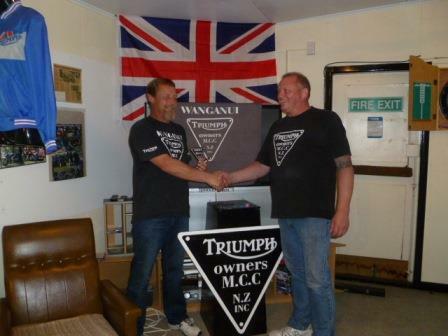 Well done Lance … you’re an asset to the Triumph Owners Club and the Ulysses Club! In addition to the above members, several other members were lucky/sneaky enough to avoid getting their photos taken. 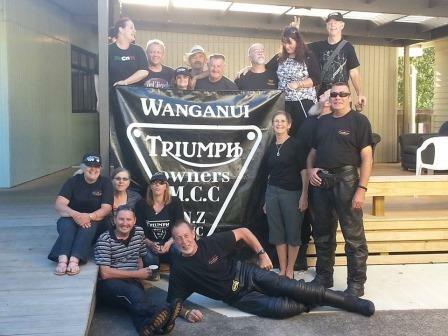 So congratulations also go to Rick Weller (15 years), Bronny Ross (10 years) and Liz Benny (10 years). Congratulations to you all on a sterling effort!